Uta Thyra Hagen (12 June 1919 – 14 January 2004) was a German American actress and theatre practitioner. She originated the role of Martha in the 1962 Broadway premiere of Who's Afraid of Virginia Woolf? by Edward Albee (who called her "a profoundly truthful actress"). Because Hagen was on the Hollywood blacklist, in part because of her association with Paul Robeson, her film opportunities dwindled and she focused her career on New York theatre. She twice won the Tony Award for Best Actress in a Play and received a Special Tony Award for Lifetime Achievement in 1999. She later became a highly influential acting teacher at New York's Herbert Berghof Studio and authored best-selling acting texts, Respect for Acting, with Haskel Frankel, and A Challenge for the Actor. Her most substantial contributions to theatre pedagogy were a series of "object exercises" that built on the work of Konstantin Stanislavski and Yevgeny Vakhtangov. She was elected to the American Theatre Hall of Fame in 1981. Born in Göttingen, Germany, daughter of Thyra A. (née Leisner) and Oskar Frank Leonard Hagen, Hagen and her family emigrated to the United States in 1924, when her father received a position at Cornell University. She was raised in Madison, Wisconsin. She appeared in productions of the University of Wisconsin High School and in summer stock productions of the Wisconsin Players. She studied acting briefly at the Royal Academy of Dramatic Art in 1936. After spending one semester at the University of Wisconsin, where her father was the head of the department of art history, she left for New York City in 1937. Her first professional role was as Ophelia opposite Eva Le Gallienne in the title role of Hamlet in Dennis, Massachusetts in 1937. Hagen was cast, early on, as Ophelia by the actress-manager Eva Le Gallienne. From there, Hagen went on to play the leading ingenue role of Nina in a Broadway production of Anton Chekhov's The Seagull which featured Alfred Lunt and Lynn Fontanne. It was 1938; Hagen was just 18. This experience left an indelible mark on the young actress, as she later reflected, "My next job was Nina in The Seagull, [her Broadway bow] with the Lunts, on Broadway. That sounds incredible, too. They were an enormous influence on my life." She admired "their passion for the theatre, and their discipline. It was a 24-hour-a-day affair, and I never forgot it—never!" The New York Times' critic Brooks Atkinson hailed her Nina as "grace and aspiration incarnate". 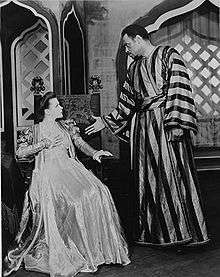 She played George Bernard Shaw's Saint Joan (1951) on Broadway, and Desdemona in a production which toured and played Broadway, featuring Paul Robeson as Shakespeare's Othello and her then-husband Jose Ferrer as Iago. She took over the role of Blanche DuBois in A Streetcar Named Desire for the national tour, which was directed not by Elia Kazan who had directed the Broadway production but by Harold Clurman. Hagen had had a revelatory experience when she first worked with Clurman in 1947. In Respect for Acting, she credited her discoveries with Clurman as the springboard for what she would later explore with her husband Herbert Berghof: "how to find a true technique of acting, how to make a character flow through me". She played Blanche (on the road and on Broadway) opposite at least four different Stanley Kowalskis, including Anthony Quinn and Marlon Brando. Through interviews with her and contemporary criticism, the report is that Hagen's Blanche refocused the audience's sympathies with Blanche rather than with Stanley (where the Brando/Kazan production had leaned). Primarily noted for stage roles, Hagen won her first Tony Award in 1951 for her performance as the self-sacrificing wife Georgie in Clifford Odets' The Country Girl. She won again in 1963 for originating the role of the "I-wear-the-pants-in-this-family-because-somebody's-got-to" Martha in Edward Albee's Who's Afraid of Virginia Woolf?. (An original cast recording was made of this show.) In 1981 she was elected to the American Theatre Hall of Fame and in 1999 received a "Special Lifetime Achievement Tony Award". Hagen considered the period between 1938 and 1947 as "the transitional years of my career, during which I lost my way and a love of acting until I finally regained it to begin a true life in the theater." Although she appeared in some movies, because of the Hollywood blacklist she had more limited output in film and on television, not making her cinematic debut until 1972. She would later comment about being blacklisted, "that fact kept me pure." She was nominated for a Daytime Emmy Award as "Outstanding Supporting Actress in a Drama Series" for her performance on the television soap opera One Life to Live. She taught at HB Studio, a well-known New York City acting school on a cobblestone, tree-shaded street in the West Village. She began there in 1947, and married its co-founder, Herbert Berghof, on January 25, 1957. Later in her life, Hagen undertook a return to the stage, earning accolades for leading roles in Mrs. Warren's Profession (1985), Collected Stories, and Mrs. Klein. After Berghof's death in 1990 she became the school's chairperson. Hagen was an influential acting teacher who taught, among others, Matthew Broderick, Christine Lahti, Amanda Peet, Jason Robards, Sigourney Weaver, Katie Finneran, Liza Minnelli, Whoopi Goldberg, Jack Lemmon, Charles Nelson Reilly, Manu Tupou, Debbie Allen, Herschel Savage, Jon Stewart, and Al Pacino. She was a voice coach to Judy Garland, teaching a German accent, for the picture Judgment at Nuremberg. Garland's performance earned her an Academy Award nomination. In 1947, I worked in a play under the direction of Harold Clurman. He opened a new world in the professional theatre for me. He took away my 'tricks'. He imposed no line readings, no gestures, no positions on the actors. At first I floundered badly because for many years I had become accustomed to using specific outer directions as the material from which to construct the mask for my character, the mask behind which I would hide throughout the performance. Mr Clurman refused to accept a mask. He demanded ME in the role. My love of acting was slowly reawakened as I began to deal with a strange new technique of evolving in the character. I was not allowed to begin with, or concern myself at any time with, a preconceived form. I was assured that a form would result from the work we were doing. Thoughts and feelings are suspended in a vacuum unless they instigate and feed the selected actions, and it is the characters' actions which reveal the character in the play. Respect for Acting is used as a textbook for many college acting classes. She also wrote a 1976 cookbook, Love for Cooking. In 2002, she was awarded the National Medal of the Arts by President George W. Bush at a ceremony held at the White House. In 2001, Hagen agreed to be filmed giving master classes in NYC, LA, Toronto and Chicago by Karen Ludwig and Pennie Dupont, who released the video entitled Uta Hagen's Acting Class, a two-part set that captures her master classes. The video has been thoroughly studied and is now taught in many acting classes. Harvey Korman talks about studying under her during his Archive of American Television interview in 2004. David Hyde Pierce worked with Hagen in the Richard Alfieri play Six Dance Lessons in Six Weeks, at the Geffen Playhouse in 2001. Hyde Pierce spoke at her 2004 memorial at Manhattan's Majestic Theater. Uta Hagen was married to José Ferrer from 1938 until 1948. They had one child together, their daughter Leticia (born October 15, 1940). They divorced partly because of Hagen's long-concealed affair with Paul Robeson, their co-star in Othello. Hagen married, secondly, Herbert Berghof on January 25, 1957, a union that lasted until his death in 1990. 1951 Tony Award, Actress- Play, The Country Girl"
1963 Tony Award, Actress- Play, " Who's Afraid of Virginia Woolf?" Hagen was quoted, saying, "Awards don't really mean much." "Once in a while, there's stuff that makes me say, That's what theatre's about. It has to be a human event on the stage, and that doesn't happen very often." ↑ Hagen, Uta (1973). Respect for Acting. New York: Wiley Publishing, Inc.
↑ "''The New York Times'', March 3, 1981 - ''26 Elected to the Theater Hall of Fame''". Nytimes.com. 1981-03-03. Retrieved 2013-11-14. ↑ Current Biography Yearbook - Maxine Block, Anna Herthe Rothe, Marjorie Dent Candee - Google Books. Books.google.ca. Retrieved 2013-11-14. ↑ Port of New York, passenger list of the S.S. Luetzow, September 4, 1924, sheet 41. ↑ Port of New York, passenger list of the S.S. Westernland, December 24, 1936, sheet 165. ↑ "Lady Invincible", Wisconsin Academy Review, vol. 46, issue 4, Fall 2000. 1 2 Gussow, Mel (15 January 2004). "Uta Hagen, Tony-Winning Broadway Star and Teacher of Actors, Dies at 84". The New York Times. ↑ "Uda Hagen acting class". coloradoschoolofacting. Retrieved 8 November 2015. ↑ Oxman, Steven (10 June 2001). "Review: 'Six Dance Lessons in Six Weeks'". Variety. Retrieved 29 September 2016. ↑ "Private Tutor". Infoplease.com. Retrieved 2013-11-14. ↑ Archived July 11, 2010, at the Wayback Machine. ↑ "Book of Members, 1780–2010: Chapter H" (PDF). American Academy of Arts and Sciences. Retrieved July 25, 2014. ↑ "Uta Hagen Quotes". BrainyQuote. 1919-06-12. Retrieved 2013-11-14.